Let’s lay our cards on the table right now. If you’re searching for the perfect Lake Havasu home, stop. Perfection does exist. Even newly constructed homes can have their issues. When you’re a first-time home buyer, you want a home that’s flawless. Well, to be honest, most buyers look for that. If you wait until you find a property with no imperfections at all, you’ll never own a home. But, with a home inspection, you’ll be able to determine if those minor fixes are major problems. Below, I’ve provided a little knowledge for you. Consider this your class in Lake Havasu Home Inspection 101: what buyers need to know. First, hire a licensed inspector to perform your Lake Havasu home inspection. With their license, inspectors must adhere to the standards and practices issued by the American Society of Home Inspectors (AHSI). This varies from state to state. For more information, please visit the Arizona Chapter of AHSI’s website here. 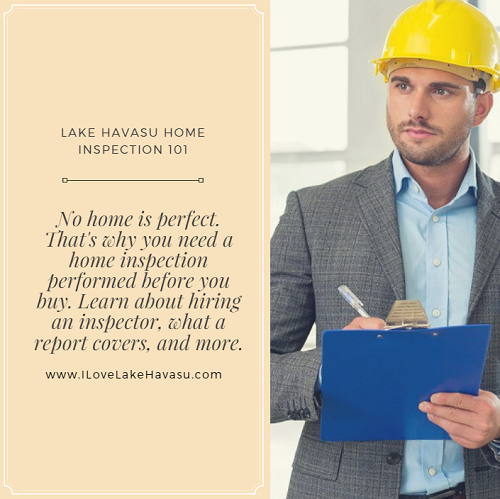 If you are unsure where to start looking for an inspector, ask your Lake Havasu REALTOR@ for a recommendation. Knowing what a Lake Havasu home inspection covers can be crucial. The report represents a visual inspection of a home’s operating systems as well as the structure itself. The inspector looks for cracks or holes that may signal a problem in the structural integrity of a house. They turn on and off the water, light switches, and air conditioning or heating system to make sure that these are working properly. They’ll take a look at the windows, roof, any visible insulation, and doors. However, they don’t move items to inspect behind them. For example, if a piece of furniture or artwork hides water damage or mold, it may not be seen by the inspector. Also, they won’t check for pests. That requires a separate inspection. However, they may notate any visible signs of termites, roaches or mice. And while they do make a visual inspection of the roof’s overall appearance, they won’t necessarily go up on your roof for a closer look. That also requires a separate inspection if you want to investigate it further. When the inspector schedules a time for the home inspection, make sure you’re present for it. Give the inspector room to perform their inspection. However, feel free to ask any questions you may have. Being there to have the inspector show you exactly what they see can provide valuable information to you. Finally, when it comes to your Lake Havasu Home Inspection 101 lesson, keep realistic expectations. The seller most likely will not agree to fix every single thing the inspector lists in their report. Nonetheless, they may fix some of the issues or provide a credit towards repairs you need to make after you become the new homeowner. It is up to you to decide whether or not these repairs are doable or if you should walk away from this deal altogether. A home inspection helps provide the information needed to make this decision.